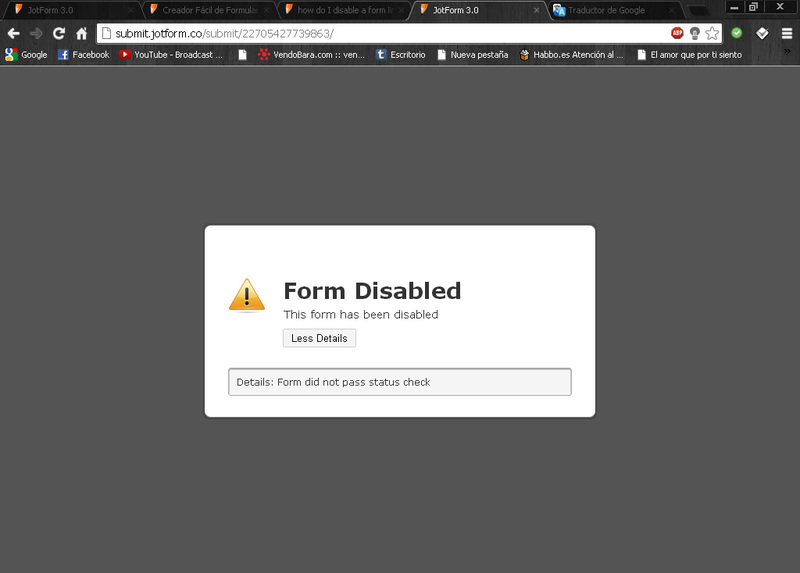 Form Disabled This form has been disabled? Excuse my English I speak Spanish. I got this notice Disabled Form This form has been disabled. I've read in forums that disable the form for requesting passwords or email addresses. But what I am asking is apsa email to contact my client and this is an event you do register for gamers and give a number of key banking transaction which I need to check if my client has paid. No confidential customer information or anything like that, I hope you can help me soon thanks. I'm having the same problem. My form is NOT a login form. It's simply a request for a generic demo password. How do I get my account unlocked? @Arzerex, you are overlimit as you have used 19 off the alloted 10 SSL submissions this month. I have reactivated your account a reset your SSL submission count to 5. We can only do this once, please remove any embedded forms making use of secure URLs if you dont want this happening again.